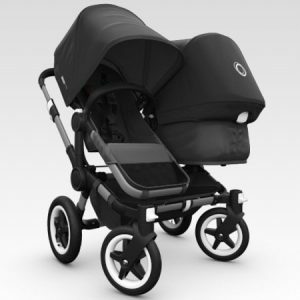 Bugaboo is a dutch company with its headquarters in Amsterdam and it has offices all over the world. It was established in 1999 by designer Max Barenbrug and physician Eduard Zanen. 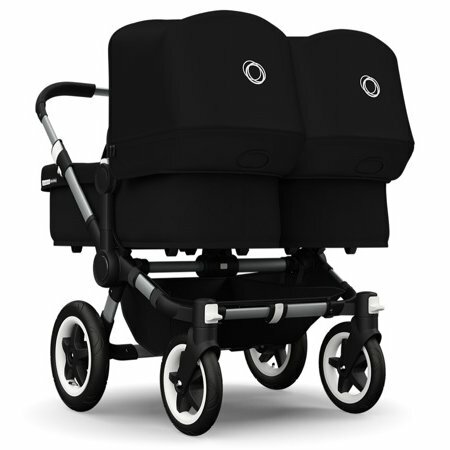 The Donkey is designed to be a convertible stroller for one child, two children or for twins. It simply converts to any of these roles. There is lots of luggage or shopping space and it handles really well. 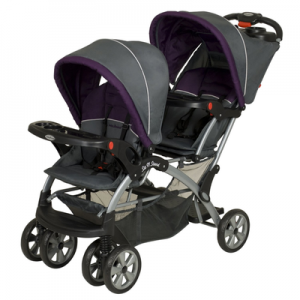 But be aware, when this stroller is in duo or twin mode, this is a wide stroller. Prices start at around $1,100. When you purchase it, you will have to decide what mode/configuration you want. Mono – has a single seat that can be changed to a bassinet and also has a detachable bag. With all of these configurations there is a setup that will suit just about any family. All of these modes are easily interchangeable. 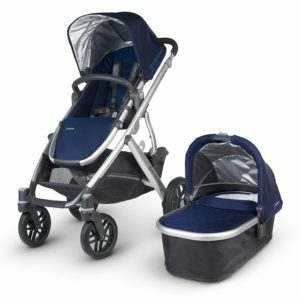 The stroller is easy to adjust in width to accommodate these configurations so when you drop one of your children off at daycare, you can narrow the stroller down to a single stroller (mono) and still leave room for a large shopping bag. There is no real way of replacing the Bugaboo Donkey, it’s unique. Because it’s such an expensive stroller, it’s out of range of most people. 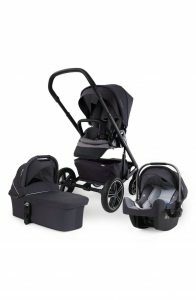 If you’re looking for great deals on strollers check out my stroller deals page. In the table below I’ve got some really great double stroller options that won’t break the bank. Check Price The Best value double option. The Donkey stroller is deceptively maneuverable. Most Bugaboo Donkey stroller reviews will show this. In single or duo mode you can push and steer it with one hand when on paved surfaces. On rough or soft surfaces you will need both hands. 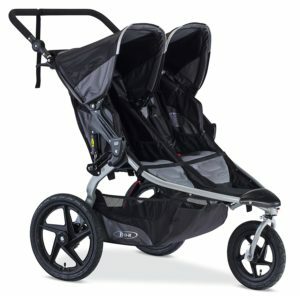 This is not a light stroller and when in duo or twin mode, be prepared to work harder. The front wheels can lock for traveling over rougher ground. Changing the configuration on the Bugaboo Donkey is very straightforward. All you have to do is flip a latch to expand the frame or to make it smaller. 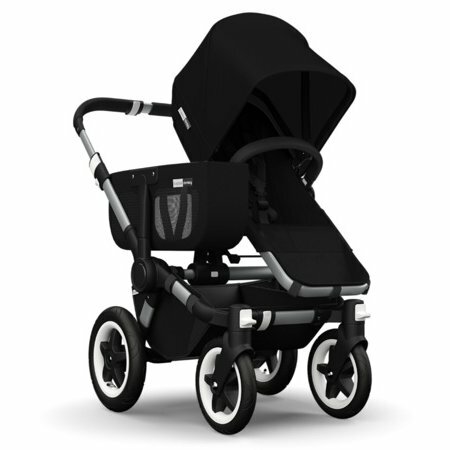 The stroller frame and seat/bassinet weighs almost 30 pounds in mono mode and almost 35 pounds in other modes. The weight is not an issue when pushing on smooth, flat surfaces but it does become an issue when you have to lift it. Stairs and public transport will be an issue and should be considered before purchasing. If you have a small hallway then there will be a problem. 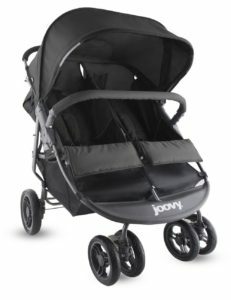 This is a large stroller and you need to think about where you are going to store it. Will you have to fold it each time you are finished with it? The seats are reversible. This is done by pulling up on two levers. The recline function is very easy to use also and this is done by lifting a tab in the back of the seat and tilting to the desired setting. All of this can be done with one hand. The seats have a 5-point safety harness. 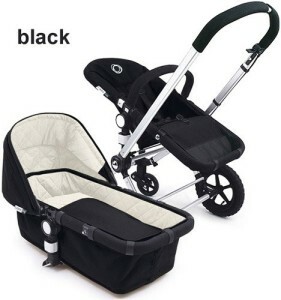 Folding is not too difficult in this stroller but being such a large stroller there are some problems. Even when folded, the Donkey takes up a lot of room. If you use a bassinet, then the space needed is much more. If you use a small car, the wheels may have to be removed and this is acceptable if you do not have to do it too often. The wheels are not difficult to remove. 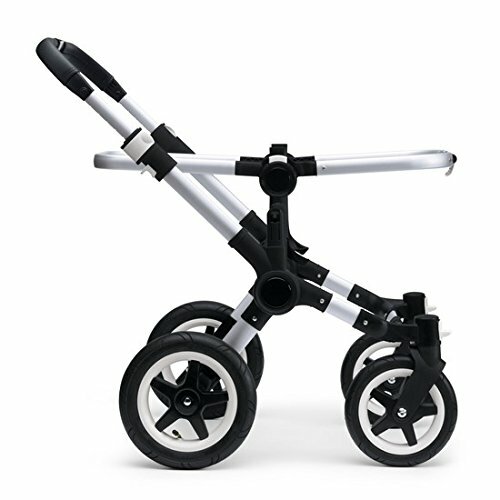 Sometimes we have to take our strollers over sand, snow or other soft surfaces and it can become very difficult to push. A great feature of the Donkey (similar to the Bugaboo Cameleon or the Bugaboo Frog is that it can be converted to a two wheel mode where it is pulled instead of pushed. This is much easier than pushing. 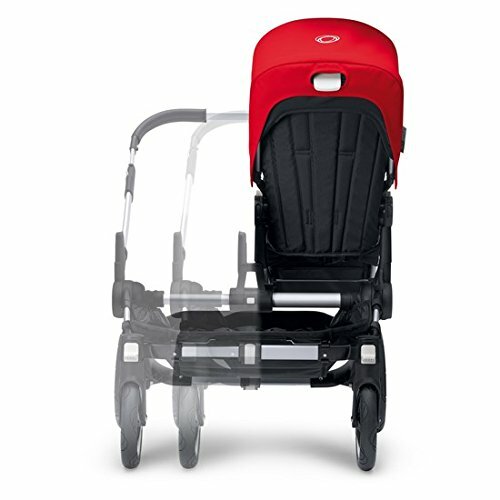 The handlebar is telescopic to accommodate parents of different heights. This can even be done while walking. 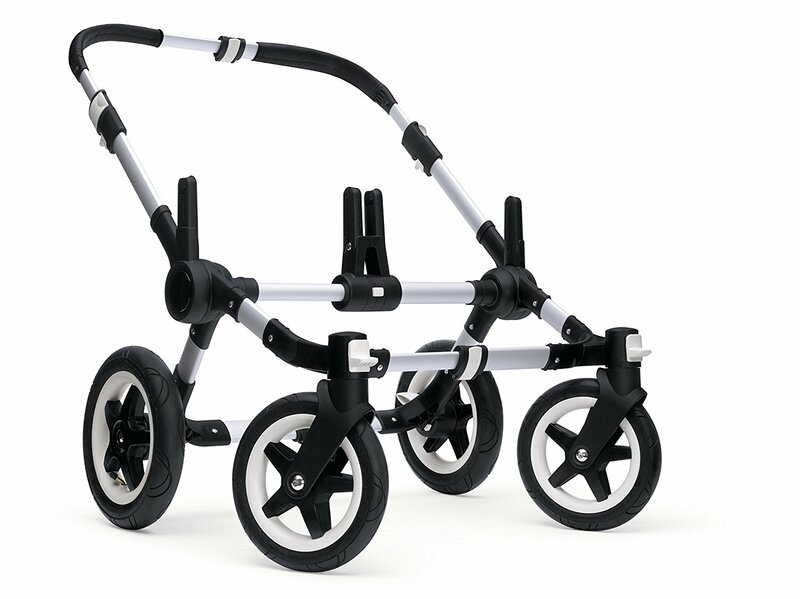 10″ Swivel wheels and 12″ rear wheels with air filled tires. The swivel wheels can be locked by pushing down on the levers on each side. The brakes are foot operated. Pressing the pedal applies the brake and flipping the pedal back again releases the brake. You will have to place your foot behind the pedal to do this and this can damage shoes or even toe nails. When going down steep hills, it sometimes feels like it is pulling away and a hand operated brake would have been beneficial to help control this. The underseat basket is large enough to hold a purse and some other items. However it is the detachable bag that makes all of the difference and it looks good too. 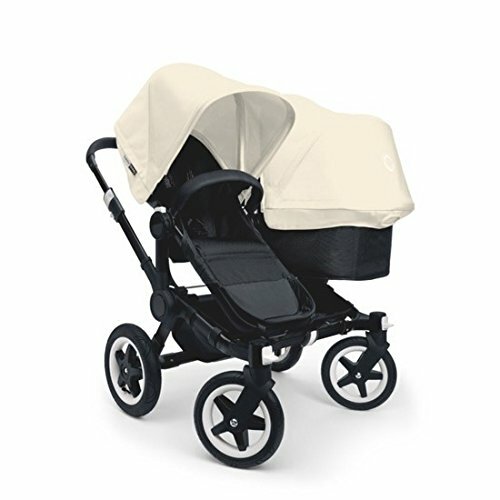 The Bugaboo Donkey is a very expensive item so it makes sense to try to buy it if it’s ever on sale. 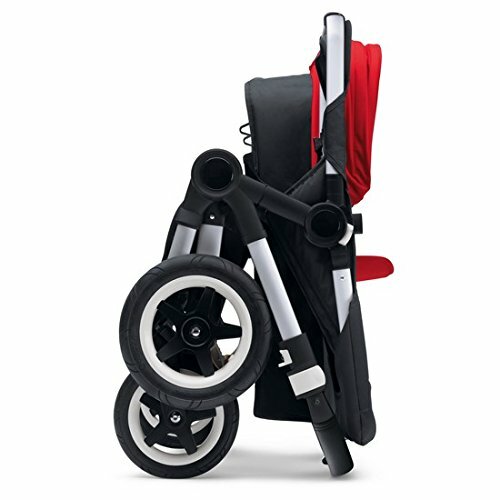 Try the strollerdepot.com (link will open in a new tab). 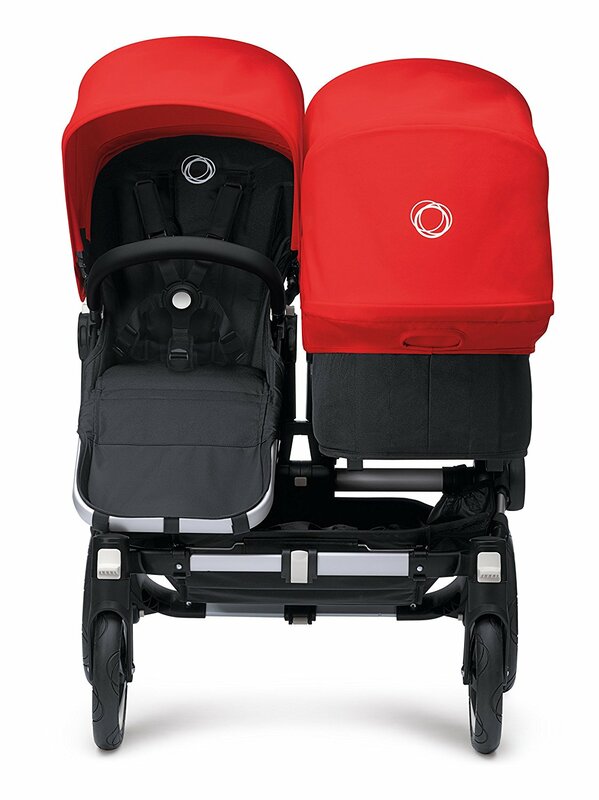 There is nothing else on the market that comes close to doing everything that the Bugaboo Donkey does. This stroller can be used as a single, a double and then back to a single again in a very simple and quick manner. It also handles rough ground with ease. The only thing it isn’t is an umbrella stroller. 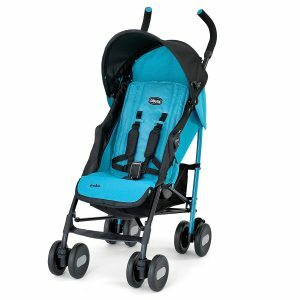 However it is a large stroller (similar to the Quinny Speedi) so if you have a small trunk or hallway, you may want to think twice before purchasing. 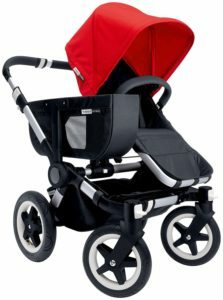 It is a heavy stroller too and if you have a weak back then go for a lighter stroller. The Bugaboo Donkey Stroller retails for approximately $1200 to $1700 and so it is obviously not cheap. But this is a great stroller. It is well constructed and it is versatile. It does a lot of things but this means that it has some drawbacks. Its weight and size may be a problem but for many people this will not be a problem. If you are one of those people then this stroller is a great stroller and will adapt to a growing family. Another popular bugaboo stroller is the Bugaboo Bee.